I never expected to be this psyched for the Olympics; the past week has just been amazing! I’ve had friends over for dinner to watch sport. I’ve been with friends to Hyde Park to watch sport. I’ve visited the Holland Heineken House… to watch sport. And then two days I actually went to the O2 and Earls Court to watch real life actual sport. And it was awesome. 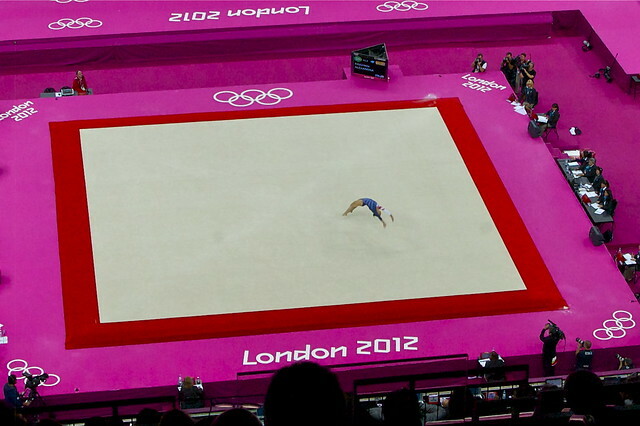 I managed to get tickets to the Gymnastics last week, after enjoying the men’s team finals on TV. 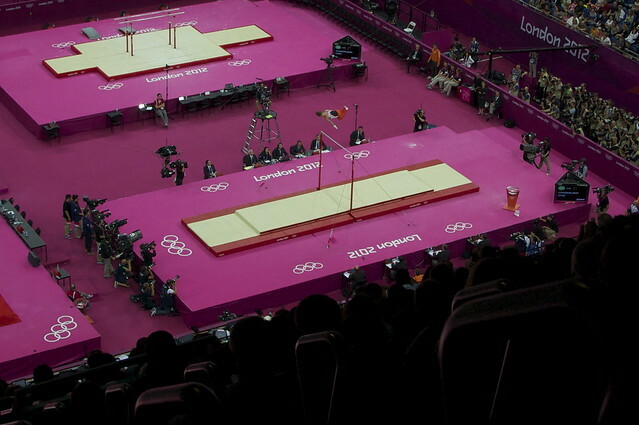 Four finals: men’s parallel bars, men’s horizontal/high bar, women’s beam and women’s floor. Great! 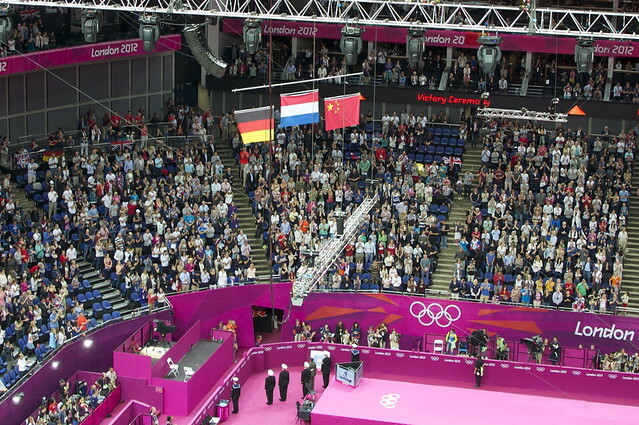 What I didn’t realize at the time though was that a Dutch gymnast (Epke Zonderland) had made it through to High Bar finals and that he was likely to win… Oh, and his nickname is the Flying Dutchman (obviously). So on Tuesday I made my way to the O2 the North Greenwich Arena. I often go to the O2 the North Greenwich Arena, cause our closest Cineworld is there, but I’ve never actually been there before for an event (I have gotten stuck there accidentally during events though, visiting the cinema and getting stuck between Glee fans trying to getting home). I have to say everything was well arranged: the security check, picking up the tickets, getting into the arena, everything was painless. The seats I got were the cheapest ones they had (at £50 per person), so we weren’t exactly sitting up close, but it was still great to be able to see it all live. Before the actual finals started they had a cool mini performance about gymnastics and how it needed agility, strength, grace and balance. They apparently showed this before each gymnastics event; I found a video if you want to watch the entire thing. Then the finals started! 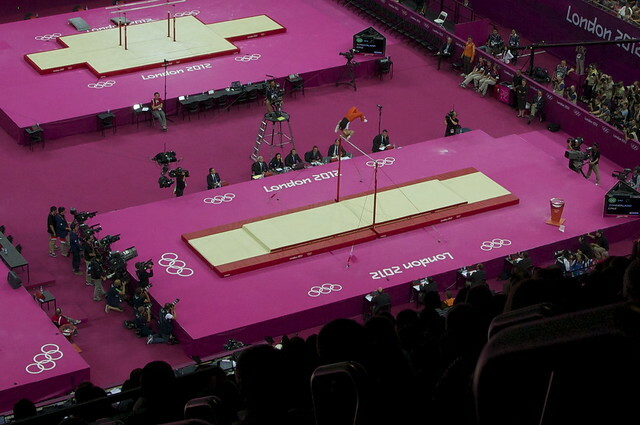 First up was the men’s parallel bars, which was awesome to watch. None of my photos turned out great though; I was too mesmerized watching it all! 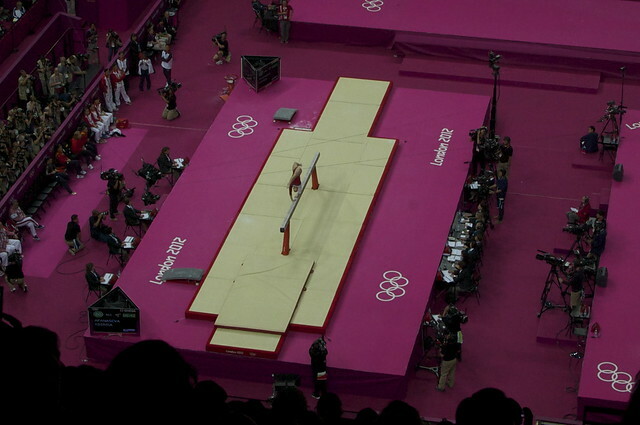 Second was the women’s beam finals, which had a fair bit of drama. So much balance, precision and strength is needed to pull off these routines; it’s a tough sport. 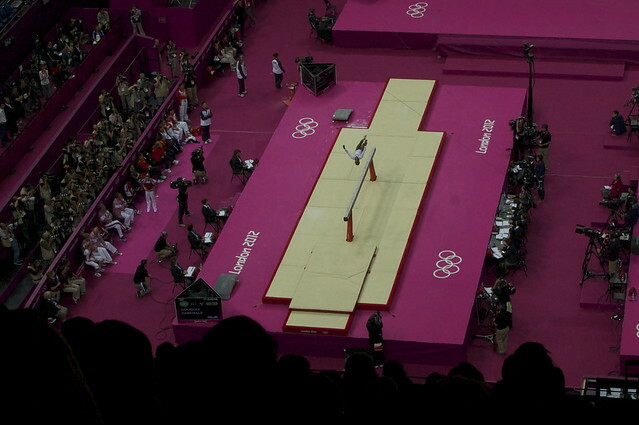 A lot of the gymnasts messed up, loosing their balance, falling from the beam and getting points deducted. The gold and silver was pretty obvious, both going to China (Linlin Deng and Lu Sui). 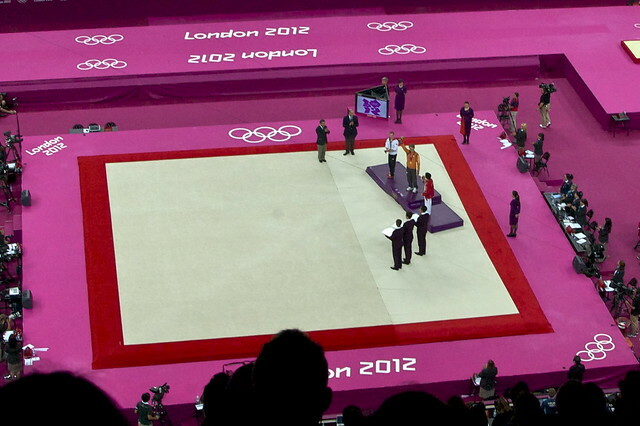 The bronze though initially was going to go to Catalina Ponor who had 15.066 points. 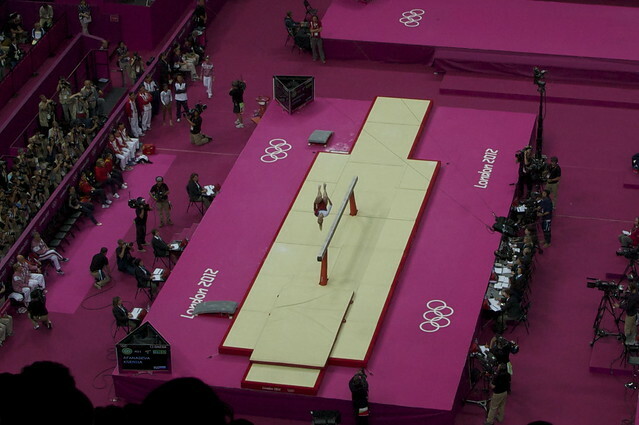 In 4th place though was Alexandra Raisman from the US with 14.966 points, who contested that score. The judges re-evaluated it and gave her 0.1 extra, putting her on the same score as Ponor! Raisman had a higher difficulty score though (the overall score is an average of the difficulty score plus the execution score) and she ended up with the bronze! After that it was time for the high bar! I think it’s my favourite apparatus; it’s just so awesome to watch. 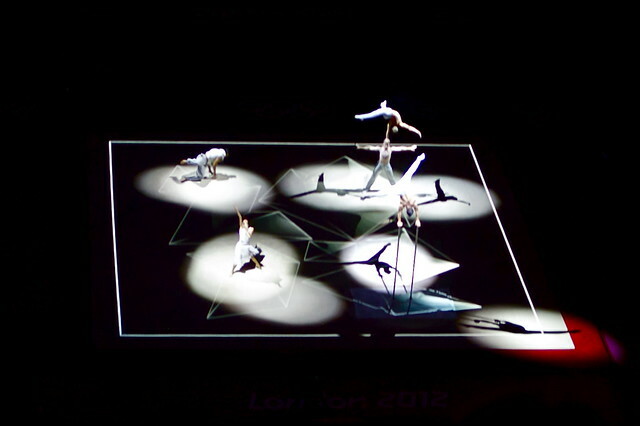 There were 4 gymnasts before Epke Zonderland and each of them was amazing. But then it was Zonderland’s turn. WOW! His routine was absolutely stunning! If you haven’t seen his routine, check it out here on the BBC page. The crowd was also going completely mental during it; with every jump he made, the crowd cheered, each cheer louder than the previous one. The three jumps at the start are one of the hardest release combinations, a Cassina to Kovacs to Kolman, and Zonderland pulled it off. It was just so awesome to watch. With such an awesome routine he of course got GOLD! Whohooo! I can now say I saw a fellow countryman get GOLD at the Olympics! He’s the first Dutch male gymnast to win a gold medal in gymnastics ever, and it’s the Netherlands’ first Olympic gymnastics gold medal since the Dutch women’s team win in Amsterdam in 1928. Last up was the women’s floor finals. Again this was pretty great to watch live; the jumps and flips these girls can make are so impressive. This time Alexandra Raisman got gold (who ended up getting bronze on the beam), Catalina Ponor got silver (who ended up 4th on beam, edged out by Raisman) and Aliya Mustafina got bronze. So that was my first Olympics event ever! It was a once-in-a-lifetime experience, and I’m so glad I managed to get tickets for it. I had to make a mad dash across London after that though to go to my second Olympic event: Volleyball at Earls Court. More about that tomorrow!